Azalea Orthopedics Surgeon, Dr. Todd Raabe, now performs the procedures at ETMC Tyler using the new Mazor Robotics Renaissance® guidance system. 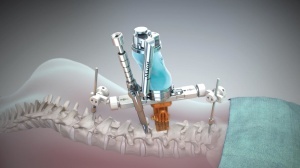 He has used this state-of-the-art technology for spine surgery more than 100 times. According to the National Scoliosis Foundation, about 7 million Americans develop scoliosis, which is a curvature of the spine. Options include a brace or surgery to place straightening rods in the back. Usually children will have the surgery when they are a teenager and have stopped growing, but adult patients can also benefit from the procedure. “Acquiring the Mazor Robotics Renaissance® is part of ETMC’s commitment to delivering the highest standard of care for our patients,” said Brian Brennan, vice president of operations. “We are pleased we can offer this surgery option in East Texas so patients don’t have to leave the region for care.” Less than 100 hospitals in the world offer this technology. Mazor Robotics technology has been clinically validated to ensure 1.5mm accuracy for increased patient safety compared to freehand spine surgery. On the day of the surgery, additional X-rays are taken and the software synchronizes these images with the uploaded images, creating a precise plan for the surgeon. Dr. Raabe says the technology makes an amazing difference for his patients. Azalea Orthopedics newest spine surgeon Dr. Michael Merrick will also be using the Mazor Robotics technology.